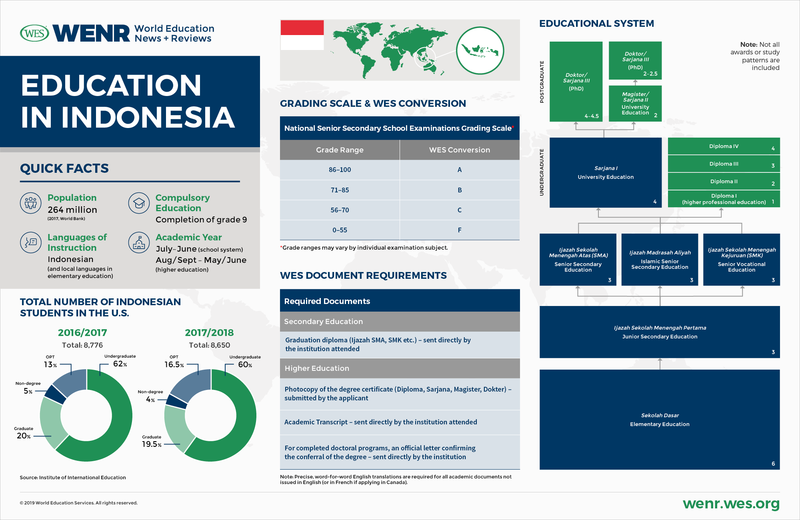 This education profile describes recent trends in Indonesian education and student mobility and provides an overview of the structure of the education system of Indonesia. It replaces an earlier version by Nick Clark. Indonesia, home to 264 million people (2017, World Bank), is the fourth most populous country in the world. It is also the largest archipelago on the globe. Its territory spans more than 17,000 islands that stretch for 3,181 miles along the equator between the Pacific and Indian Oceans. About 87 percent of Indonesia’s population is Sunni Muslim, making Indonesia the largest majority Muslim country in the world. But the Southeast Asian country is simultaneously a diverse, complex, and multicultural nation of more than 300 ethnic groups that speak hundreds of different languages. Some 10 percent of the population identify as Christians and about 1.7 percent as Hindus. Indonesia’s three largest ethnic groups are the Javanese (40.1 percent), primarily located on Java, the world’s most populated island and home to more than 50 percent of the total Indonesian population; the Sundanese (15.5 percent); and the Malays (3.7 percent). Indonesia’s cultural and regional diversity is as vast as the number of its islands. Areas like rural West Timor or Indonesian Borneo (Kalimantan) are worlds apart from the flashy shopping malls of downtown Jakarta, Indonesia’s capital city of about 10 million people. Despite these marked differences, Indonesia is viewed as having a promising economic future; it’s bound to become a country of global importance in the 21st century. The island nation is currently transitioning from an agricultural economy driven by commodity exports to an economy based on industrial manufacturing and services. The professional services firm PricewaterhouseCoopers projects that Indonesia will grow into the world’s fourth-largest economy by 2050. This astonishing economic rise is partially based on demographic trends that will increase the country’s population to about 321 million. It’s estimated that 70 percent of the population will be working-age adults by 2030, a circumstance that will supply the nation with a beneficial demographic structure and a voluminous labor pool. Underscoring Indonesia’s tremendous economic potential, the country’s middle class is expected to double between 2013 and 2020. Meanwhile, urbanization is accelerating rapidly, and internet penetration rates have increased by more than 20 percent between 2013 and 2016 alone. The percentage of people who have access to electricity has jumped from 55 percent in 1993 to 98 percent in 2016. Recent economic growth rates have been relatively low compared with growth rates before the 1997 Asian financial crisis, but GDP has nevertheless increased steadily by more than 5 percent for most of the past eight years. However, Indonesia is characterized not only by deep regional disparities, but also by its status as a developing country that is difficult to govern and that remains marred by various socioeconomic problems. It ranks 116th out of 189 on the UN’s Human Development Index, and its GDP per capita is less than half that of neighboring Malaysia. Twenty-seven million Indonesians still live on less than USD$0.75 a day. Life expectancy is seven years lower than in Vietnam. As of now, Indonesia struggles to provide inclusive, high-quality education to its citizens. The country has much lower literacy levels than those of other Southeast Asian nations. An analysis by the World Bank showed that 55 percent of Indonesians who complete school are functionally illiterate compared with only 14 percent in Vietnam and 20 percent in member countries of the Organization for Economic Cooperation and Development. Tertiary attainment levels, likewise, are very low: The percentage of Indonesians over the age of 25 that had attained at least a bachelor’s degree in 2016 was just under 9 percent, the lowest of all the member states of the Association of Southeast Asian Nations (ASEAN). There may not be much incentive to obtain a tertiary degree—unemployment rates are highest among university-educated Indonesians. The research output of Indonesian universities is growing rapidly, but it’s still low compared with that of other emerging economies. On the plus side, mean years of schooling among the population above the age of 25 have doubled since the 1980s to eight years in 2016. The pupil-to-teacher ratio has dropped from 20 to 1 to 16 to 1 in elementary education between 2004 and 2017, even though this ratio has remained flat if not decreased at higher levels of schooling (as per data from the UNESCO Institute of Statistics – UIS). The tertiary gross enrollment ratio (GER) leaped by 20 percent between 2004 and 2017, despite being still low overall. It now stands at 36.3 percent, compared with 28.3 percent in Vietnam, 42 percent in Malaysia, and 49.3 percent in Thailand (UIS). Since the mid-2000s, Indonesia has implemented a broad range of education reforms, including the decentralization of parts of its school system, improvements in teacher training standards, and sizable increases in education spending (as a share of the national budget). However, public education spending as a percentage of GDP has stagnated over the past decade and remains well below recommended levels for emerging economies (at 3.6 percent of GDP in 2015). More substantial efforts will be required to overcome structural weaknesses in Indonesia’s system and bring it up to the standards of other fast-developing countries in the dynamic ASEAN region. Outbound student flows from Indonesia are growing, but they are still relatively modest. Despite being the world’s fourth-largest country in terms of population, Indonesia was only the 22nd-largest sender of international students worldwide in 2017, making up less than 1 percent of the more than 5 million students studying abroad that year. According to UIS data, the number of Indonesian degree-seeking students enrolled overseas has grown by nearly 62 percent since 1998, reaching a high of 47,317 in 2016. This growth made Indonesia the third-largest sender of international students among ASEAN member states in 2017, behind only Vietnam (82,160) and Malaysia (64,187). However, Indonesian growth rates are dwarfed by those of smaller regional neighbors like Vietnam, where outbound student numbers mushroomed by nearly 960 percent between 1998 and 2017. Indonesia’s outbound mobility ratio is small—only a tiny fraction of the country’s students are currently heading overseas. While Vietnam and Malaysia, the two largest senders in the ASEAN, have outbound mobility ratios of 3.56 and 5.14 percent, only 0.57 percent of Indonesia’s tertiary students are studying abroad, the second-lowest percentage among all ASEAN member states after the Philippines. This discrepancy is even more pronounced in the case of smaller countries like Singapore and Brunei, which have sky-high outbound mobility ratios of 12.92 and 30.99 percent respectively. Even though outbound student flows are presently small, demographic and socioeconomic factors suggest that Indonesia will play a major role in international education in the years to come. Not only does Indonesia have by far the largest student age population in the ASEAN, it also has the third-largest population under the age of 25 in the entire world: More than 117 million in 2017, following only India (616,550,830) and China (417,665,920). Consider that more than 40 percent of Indonesia’s population is under the age of 25, with approximately 27 percent under the age of 15; the median age is approximately 30.5 years. This large university-age population means that Indonesia has a substantial pool of potential international students. This is especially so, given the expected rise of disposable incomes in Indonesia. The McKinsey Global Institute projected in 2012 that Indonesia’s “consuming class” will grow “stronger than in any economy of the world apart from China and India,” and will triple from 45 million to 135 million people by 2030. Demand for higher education will also be driven by the fact that there is a severe skilled labor shortage in Indonesia. A 2014 World Bank Policy Brief found that despite a doubling of the number of workers who have at least some tertiary education between 2000 and 2010, still only 8 percent of workers possessed a tertiary degree, far short of the 21 percent demanded by the labor market. This unfulfilled demand is likely to yield increases in tertiary enrollment rates in the long term, current unemployment rates among university graduates notwithstanding. Already, between 2006 and 2016, total enrollment grew by 68 percent, from nearly 3.7 million to more than 6.1 million. A compounding factor is that rising demand for quality higher education is presently not met by supply in Indonesia, and that current curricula are ill-suited for the labor market. The vast majority of Indonesian higher education institutions (HEIs) are smaller private providers of lesser quality, while admission into public universities is highly competitive. Already in 2010, public universities had capacity for merely 18 percent of Indonesia’s swelling number of high school graduates. In light of such bottlenecks and quality shortcomings, growing numbers of students from middle-income households will look overseas to obtain their degree. In fact, a recent survey conducted by AFS Intercultural Programs found that 81 percent of 13- to 18-year-olds in Indonesia had considered study abroad. Outbound mobility is also bound to be boosted by growing intraregional initiatives and scholarship programs designed to facilitate academic exchange and labor mobility, such as the ASEAN Qualifications Reference Framework (AQRF) or the ASEAN International Mobility for Students (AIMS) program. AIMS supports study abroad for one semester at participating institutions in the ASEAN. While the program is still small, with fewer than 1,000 students participating in 2016, numbers have increased steadily since its launch in 2010. Meanwhile, funding for the Indonesia Endowment Fund for Education, a governmental scholarship program for graduate students studying both domestically and abroad, has more than doubled between 2016 and 2017, from USD$105 million to USD$225 million. Given the high costs of studying abroad, such scholarship funding, if sustained, will play a vital role in boosting mobility. Nearly half of Indonesian students surveyed in 2017 indicated that they would require financial assistance in order to study abroad. 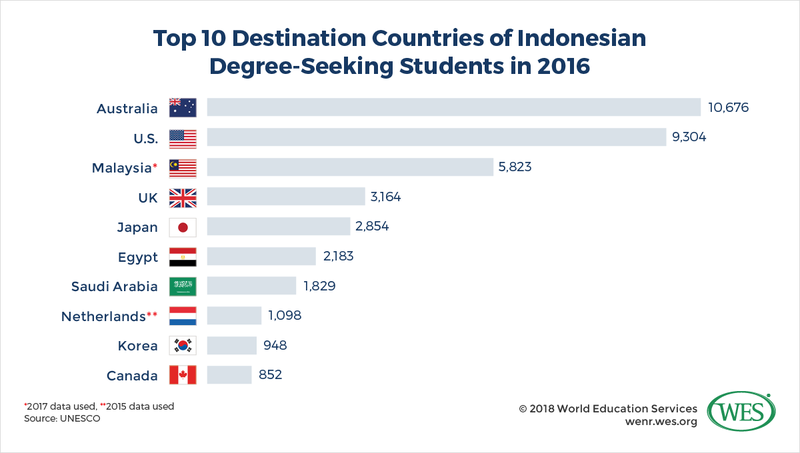 The top three destination countries for Indonesian degree-seeking students enrolled overseas are Australia, the U.S., and Malaysia. Together, these three countries make up the study destinations of nearly 60 percent of all outbound Indonesian students. In Australia, the number of tertiary degree-seeking students as reported by the UIS has remained stable at around 10,000 over the past few years. There were 10,646 Indonesian degree students in the country in 2016 compared with 10,148 in 2004. That said, when taking into consideration students who are enrolled in vocational programs, secondary education, and English Language Training programs, the number of Indonesian students has grown by 29.5 percent over the past decade, from 16,063 in 2008 to 20,797 in 2018, according to Australian government data. The country is attractive to Indonesian students because of its “geographic proximity, perceived institutional quality, and English-medium instruction….” The Australian government’s easing of student visa requirements for Indonesia and other countries in 2012 has also helped attract students from the archipelago. Indonesia is presently the 10th-largest country of origin of international students in Australia. However, it remains to be seen how the eagerly awaited opening of Australian branch campuses in Indonesia will affect student flows. In 2018, Indonesia legally allowed foreign branch campuses to operate in the country. It signed a free trade agreement with Australia that lays the groundwork for Australian universities like the University of Melbourne and the University of Queensland to establish branch campuses in Indonesia. While this trend, if it materializes, is expected to enable larger numbers of Indonesians of more limited financial means to enroll in Australian institutions, it may simultaneously stop other students from going to Australia, since they’ll be able to access Australian education in Indonesia. Like Australia, Malaysia is a popular choice for mobile Indonesian students because of its geographic proximity. But the country is also attractive because of its cultural, religious, and linguistic similarities to Indonesia. Also, the strong migrant networks that have developed over decades of large-scale migration may provide a reassuring cultural environment for Indonesian students. Beyond that, Malaysia is a relatively affordable study destination compared with Western countries, yet it has a sizable number of foreign branch campuses of reputable Western universities. While the number of Indonesian students in Malaysia has grown significantly over the past decade, despite fluctuations, it’s important to note that China is also surging in popularity as a study destination and may now attract more Indonesian students than Malaysia. The fact that there are no UIS statistics available for China prevents comparative analysis, but according to Chinese government data, there were 14,000 Indonesians studying in China in 2018 (up from 10,957 in 2011). Note that the Chinese data include different types of students, whereas UIS data for Malaysia comprise only those students enrolled in formal degree programs. While the U.S. is still the second most popular destination for mobile Indonesian students, Indonesian enrollments in the U.S. have dropped significantly in recent years. They never fully recovered after the 9/11 terror attacks. International student enrollment dropped in the wake of U.S. government-imposed visa restrictions and the globally unpopular 2003 Iraq war. According to the Institute of International Education’s Open Doors data, the number of Indonesian students decreased from 11,625 in 2000/01 to a low of 6,942 in 2010/11, before increasing modestly again to 8,776 in 2016/17. Most recently, enrollments have declined by some 1 percent to 8,650 in 2017/18, a drop coinciding with the Trump administration’s travel ban, which restricts entry to the U.S. for citizens from seven countries—five of which are majority Muslim. Indonesia is presently the 19th-largest sending country of international students to the United States. The majority (60 percent) of Indonesian students pursue undergraduate degrees, while 14 percent enroll at the graduate level, 3 percent at the non-degree level, and 8 percent participated in OPT. The most popular fields of study are STEM fields (33.1 percent total), followed by business and management (28 percent). Notably, five of the ten most popular institutions among Indonesian students are community colleges, with students at community colleges making up around 40 percent of all Indonesians applying for U.S. student visas. It’s unclear how student inflows from Indonesia will develop in the future. In general, the U.S. higher education system is attractive to Indonesian students for several reasons. The previously mentioned AFS survey reflects the high importance of English-medium instruction as well as country and institution reputation in Indonesian students’ decisions to study abroad. On the other hand, since the election of Donald Trump as president, the U.S. has become less popular according to Indonesian public opinion polls. Also, increasing tuition costs in the U.S. and the recent depreciation of the Indonesian rupiah against the U.S. dollar make it more costly for Indonesians to study Stateside. How well the U.S. can compete with Australia, Malaysia, and, most recently, China in attracting Indonesian students remains to be seen. Indonesian student enrollments in Canada are comparatively small and have fluctuated over the past two decades—from 1,655 in 2004, down to 1,015 in 2010, and back up to 1,970 in 2018. Recent growth rates have outpaced those in the U.S., possibly because of Canada’s expansion of post-study work opportunities and immigration pathways for international students. Overall, Indonesia is the 31st-largest sending country of international students to Canada. Indonesia is not a major study destination for international students. The country has the lowest inbound mobility ratio (0.07 percent) of all ASEAN countries for which data are available. Since its higher education sector is relatively underdeveloped, it doesn’t have institutions of global reputation, nor does it have capacity to provide for its own domestic student population, let alone foreign students. With many prestigious and highly ranked universities located in other Asian countries nearby, regional students looking for high-quality overseas education are unlikely to turn to Indonesia. As a result, Indonesia hosted only 5,878 international degree students in 2017 despite its size. More than 50 percent were from neighboring Malaysia (1,500 students) and Timor-Leste (1,302). Thailand, India, and China are other larger sending countries with 804, 674, and 431 students, respectively, in 2017, per the UIS. Modern education was introduced in Indonesia during the era of Dutch colonial rule, when traditional school systems like Islamic boarding schools (Pesantren) were supplemented with Dutch-language schools for the children of colonialists and local administrative elites, as well as village schools or “folk schools” for Indonesian commoners. The first HEIs were established in the 1920s on Java. The system was elitist and accessible only to the select few. After independence in 1945, Indonesia constitutionally enshrined education as a right of all Indonesian citizens and sought to establish a more egalitarian and inclusive mass education system. Although public education is mostly secular and Indonesia is formally a secular state, Islamic education is highly prominent in Indonesia’s large private education sector. The massive 29 million member-strong Islamic organization Muhammadiyah (followers of Muhammad), for instance, currently operates 172 universities, some 2,600 elementary schools, and close to 3,000 secondary schools throughout Indonesia. These institutions teach a secular, general academic curriculum in addition to religious studies. While Islamic education was long regarded as second rate, the rise of Islamic conservatism in Indonesia has led to an increase in Islamic education in public school curricula in recent years. Like other aspects of public life, education is affected by the growing Islamization of Indonesian society, which has traditionally favored a more moderate brand of Islam. Nowadays, it is not uncommon for Indonesian children to attend pesantrens, madrasahs (Islamic schools), or sekolahs Islam (modern Islamic schools). In terms of size and scope, the education system of the diverse Indonesian archipelago has become much more uniform. It has also grown rapidly since the middle of the 20th century: The number of senior secondary schools doubled from 67,000 in 1974 to more than 146,000 in 2011, while the number of HEIs tripled within just 17 years—from 1,236 in 1995 to 3,815 in 2012. Likewise, the number of elementary students jumped from 14.9 million in 1970 to 29.35 million in 2016, and the number of tertiary students surged from merely 248,000 to around 9 million over the same time span (UIS data). While Indonesia is formally a centralized “unitary republic,” it is effectively a quasi-federal state that concedes a considerable degree of autonomy to provinces like Aceh (Sumatra), the capital region of Jakarta (Java), the special region of Yogyakarta (Java), Papua, and West Papua. Overall, there are 34 provinces which are further subdivided into thousands of districts, subdistricts, cities, and more than 75,000 villages. Under the decades-long dictatorship of President Suharto, who ruled the country from 1967 to 1998, the education system was highly centralized and administered by the Ministry of Education and Culture (MOE) and the Ministry of Religious Affairs in Jakarta, with the latter overseeing religious education. However, since the end of the Suharto regime and the subsequent democratization of Indonesia, various functions of government have been decentralized and transferred to locally elected district governments. Legislation enacted in the early 2000s not only introduced free and mandatory basic education and the commitment to spend 20 percent of the national budget on education, but also gave schools throughout Indonesia much greater administrative autonomy. That said, the school system is still centrally steered by the MOE, which is responsible for curriculum development, the hiring of teachers, and national school examinations. Since 2015, higher education is overseen by a separate ministry, the Ministry for Research, Technology and Higher Education (MRTH), which supervises both public and private HEIs and ensures quality control. As discussed in greater detail below, all HEIs are additionally mandated to seek accreditation by the National Accreditation Agency of Higher Education (BAN-PT). Religious institutions, meanwhile, are overseen by the powerful Ministry of Religious Affairs. Compared with how the school system is administered, higher education is generally more centrally controlled. Most HEIs have only very limited autonomy. Indonesian is the official language of instruction in the school system, although Indonesia’s various spoken languages may also be used at the local level in the first years of elementary education. In higher education, Indonesian is the medium of instruction as well, but English is becoming more common for some programs, and textbooks are commonly printed in English. There have been some plans to make English mandatory at Indonesian universities, but these plans have not been realized as of today. The academic year in the school systems generally lasts from July to June with a break in December and during the Muslim Eid Holiday. The academic calendar at universities typically runs from August or September to May or June, divided into two semesters. Some institutions may have an additional summer semester from June to August. Education in Indonesia is compulsory and provided free of charge at public schools from grades one to nine (six years of elementary education and three years of junior secondary education). The official age of entry is seven, but many pupils enter at the age of six. The Indonesian government plans to extend compulsory education to grade 12, but these plans have not yet been implemented due to the associated costs and other reasons. Prior to elementary education, children can attend non-compulsory preschools offered by private kindergartens and day care centers, as well as public early childhood education providers. The government presently prioritizes early education and has achieved a sharp increase in the nationwide preschool GER from 50.2 percent in 2010 to 72 percent in 2014. However, significant disparities persist between the sexes and between urban and rural regions. The elementary GER in more remote island groups like Papua, Kalimantan, and Maluku, for instance, remained well below 50 percent in 2014. Elementary education (pendidikan dasar) lasts for six years (grades one to six). The curriculum comprises basic subjects like religious education, national philosophy and civics, Indonesian, mathematics, science, social science, arts, and physical education. Indonesia’s government revised the national school curriculum in 2013 to place greater emphasis on “moral character education” and creative thinking (Kurrikulum 2013). As a result, the number of mandatory subjects at the elementary level was reduced and subjects like English and information technology were removed from the elementary cycle, while the teaching of science was scaled back. However, the nationwide implementation of this new curriculum has been delayed since many schools and teachers are not yet ready for the changes, so that most schools still teach the old curriculum. One challenge is that curricula and textbooks are designed nationally in Jakarta, but teachers are trained locally in the regions. The majority of elementary schools—more than 80 percent in 2010—are public, but private institutions play an important role in Indonesia’s school system, especially at the secondary level: 57 percent of schools at the lower-secondary level and 70 percent at the upper-secondary level were private in 2010, even though a majority of students were enrolled in public institutions. Religious schools are largely private. These schools teach the standard national curriculum in addition to religious studies. About 15 percent of all schools in Indonesia were sectarian institutions in 2014; the vast majority (300,000) were Islamic institutions under MORA, compared with less than 1,000 schools affiliated to other religions like Buddhism, Christianity, or Hinduism. Islamic schools are typically tied to Islamic mass organizations and are eligible for some form of government funding even if they are privately owned. Indonesia also has the highest number of international schools in Southeast Asia. These prestigious and expensive schools teach foreign curricula and are clustered in major cities like Jakarta. Until recently they were frequented by both the children of expats and wealthy Indonesian elites, but government directives from 2014 related to the strengthening of the “moral character” of Indonesian youth barred Indonesian nationals from attending wholly foreign-owned schools, which were renamed “foreign education institutions.” Instead, Indonesians can attend so-called “joint cooperation schools” which are locally owned but accredited overseas. These schools are required to incorporate parts of the national curriculum, namely Indonesian culture and language, while still teaching foreign curricula. Aside from expensive elite schools that teach foreign curricula, however, private schools that teach the national curriculum are mostly considered a substandard choice that is reflected in the performance gaps between public and private sector students. Learning outcomes, as measured by test results in the OECD PISA study, show that students at public schools are better prepared. Even though student-to-teacher ratios in the private sector are lower than in the public sector, private madrasahs, for example, tend to have lower-qualified teachers and inadequate facilities. These quality considerations notwithstanding, enrollments in private institutions at the elementary level increased from 16 percent to 22 percent between 2004 and 2017. Enrollments at upper-secondary private schools, on the other hand, decreased from 54 to 46 percent over the same time span, according to UIS data. Lower or junior secondary education lasts for three years (grades seven to nine) and concludes with the award of the certificate of completion of junior secondary school (sekolah menengah pertama, or SMP). Pupils who complete junior secondary education at religious schools under the purview of the Ministry of Religious Affairs receive the equivalent certificate of completion of madrasah tsanawiyah (MTs). The national curriculum largely includes the same subjects as in elementary education, but also adds additional science classes in biology, chemistry, or physics; social science subjects like world history; and English. The teaching style prioritizes rote memorization; promotion and graduation were, until recently, largely based on external national examinations (ujian nasional, or UN), typically in a multiple-choice format at the end of each school year. However, national exams have been deprioritized in recent years, and since 2015 no longer make up the mandatory core assessment criterion. Now both promotion and graduation are increasingly based on continual assessment and school-based examinations, although students continue to sit for the UN. Students who complete junior secondary education and earn sufficiently high grades can enroll in either general academic senior secondary school (sekolah menengah atas, or SMA), or vocational upper-secondary schools (sekolah menengah kejuruan, or SMK, discussed below). Both general academic and vocational programs can also be completed at Islamic senior secondary schools, called madrasah Aliyah (MA), or in the case of vocational programs, madrasah aliyah kejuruan (MAK). While 55 percent of students enrolled in academic programs in 2015, enrollments in the vocational track have been growing fast in recent years, at annual rates of 12 to 14 percent between 2004 and 2012. Participation in upper-secondary education has grown briskly in general with the GER jumping from 69.5 percent to 80 percent between 2012 and 2017, according to UIS data. That said, this ratio remains far from the government’s goal of making senior secondary education universal for all Indonesian youth. There are also still significant disparities between regions and districts—GERs in some districts were still as low as 30 percent at the beginning of this decade. Senior secondary education is presently neither compulsory nor free. It lasts three years (grades 10 to 12) and is offered in different specialization streams in the general academic track. In the final two years of the program, following a common general academic core curriculum in grade 10, students can specialize in languages (Indonesian, English, and other foreign languages), sciences (biology, chemistry, and physics), or social sciences (sociology, economy, and geography). Students in religious schools specialize in religious subjects. The current curriculum places less emphasis on rote learning and examinations than previous incarnations, although students still sit for school examinations, as well as the final external UN examination at the end of grade 12. According to the most recent regulations, there are four test subjects taken in the UN: Indonesian, English, mathematics, and one elective subject from students’ respective specialization streams. Students who successfully complete the program receive a certificate of completion of senior secondary education (Ijazah SMA or Ijazah MA in the case of Islamic schools). There are also informal education programs for students who cannot access the formal system or who dropped out. These students don’t specialize—they are examined in seven subjects and receive a senior secondary school equivalency certificate (Izajah Paket C Setara SMA). Technical and vocational education and training (TVET) in Indonesia takes place both within the formal school system as well as informally in apprenticeships, other work-based training programs or training programs at governmental vocational and skills training centers (Balai Latihan Kerja, or BLK). In the formal system, TVET starts at the upper-secondary level and is offered by both secular vocational schools (SMKs) and religious schools (MAKs). There are more than 10,000 formal vocational secondary schools on the archipelago, mostly clustered on the populous islands of Java and Sumatra, about 70 percent of them private. As mentioned before, more than 50 percent of upper-secondary students in Indonesia study in the general academic track, but the government is seeking to drastically expand TVET and change enrollment ratios, so that 70 percent of students will study in the vocational track by 2020. TVET is prioritized in order to alleviate severe skilled labor shortages. The government projected in 2016 that Indonesia needs 3.8 million new skilled workers annually until 2030 to bridge a gap of 56 million skilled workers. SMK programs are typically three years in duration after grade nine, but there are also four-year “SMK plus” options. These straddle secondary and post-secondary education and lead to the award of a one-year post-secondary diploma (D1) in addition to a senior secondary school diploma. Vocational high schools offer more than 140 different specializations, including fields like agri-business technology, allied health, business and management, information and communication technologies, and engineering technology. However, 60 percent of all students enroll in just 10 popular disciplines, including accounting, computer engineering, marketing, motor vehicle engineering, multimedia, or office administration. The majority of vocational schools specialize in the fields of technology and industry (86 percent) and business and management (76 percent). SMK programs cover a general education core curriculum (including mathematics, Indonesian, English, natural sciences, social sciences, and so-called normative subjects like religious education and civics), as well as vocationally oriented subjects. Some programs may incorporate internships and other practical training components. After completing the program, students sit for national examinations in both the general education subjects and the vocational subjects. Graduates receive the Ijazah SMK and a certificate of competency in their vocational specialization. It’s currently planned that students will also earn a series of formal vocational training certificates during the course of their studies, so that graduates and school dropouts alike can obtain qualifications of greater value in the labor market. Like its secondary school system, Indonesia’s higher education system is binary in nature. It has an academic, research-oriented track and a more applied vocational or professional track. The country’s qualifications framework, established in 2012 to facilitate mobility between academic programs and the recognition of prior learning, illustrates the different subsystems and how they are related. Indonesia has a vast, rapidly growing, and highly diverse higher education landscape. Nearly 4,500 HEIs offer programs in 25,000 different majors and enroll close to eight million students (2017). There are several different types of HEIs, including universities, institutes, advanced schools, academies, polytechnics, and community academies. While enrollments at Islamic institutions are surging, most HEIs in Indonesia are secular. Only about 16 percent of institutions were faith based in 2015, including 11 public universities and 95 private universities. Together they enrolled approximately 11 percent of the total student population in 2013. The vast majority—more than 90 percent—of HEIs in Indonesia are privately owned. But while enrollments at private HEIs are swelling, many private institutions are small providers with 500 students or less, so that public institutions enroll around 37 percent of all tertiary students. Public institutions also tend to have a better reputation in Indonesia as well as internationally: All five Indonesian universities included among the top 2,000 in the current Times Higher Education World University Ranking, for example, are public, including the University of Indonesia, Indonesia’s oldest public university ranked highest at position 601—800, and the Bandung Institute of Technology (ranked at position 801—1,000). According to the MHRT, there were 573 universities in Indonesia as of 2018, more than 90 percent of them private. Many are larger multi-disciplinary institutions that offer a broad range of undergraduate and graduate programs. Universities must have at least three faculties. Few universities offer doctoral programs. Only 40,737 students were enrolled in PhD programs throughout Indonesia in 2017. Institutes are specialized university-level HEIs that offer only academic programs in particular fields. Advanced schools or schools of higher learning are the most common form of Indonesian HEI. There were 2,308 of these institutions throughout the archipelago in 2018, the majority of them smaller, specialized private schools. They typically offer undergraduate programs in a particular area of study leading up to a four-year diploma (Diploma VI) or bachelor’s degree, although some institutions also offer graduate programs. Polytechnics, on the other hand, generally offer shorter, employment-geared, vocational diploma programs. There were only 257 polytechnics in Indonesia in 2018. Academies are dedicated to vocational education at the undergraduate level and can be public or private. Community academies were initially set up as public institutions specifically designed to prepare students, including adult students, for local employment and to prioritize the labor needs of the regions where they are located. However, community academies can be privately owned as well, as long as they offer low-cost diploma programs in vocational fields of local relevance. The Indonesian government intends to establish a community academy in each district of the country. On a dispersed and disparate archipelago like Indonesia, distance education is an effective means to provide education in remote areas, even though low computer literacy rates and the lack of electricity and internet infrastructure in parts of the archipelago still limit its growth. For example, Indonesian children who lack access to physical schools can complete junior high school in open “radio schools.” In higher education, distance education was pioneered by the public Indonesia Open University (Universitas Terbuka), which evolved from a small fringe university when it was founded in 1984 to a mega-university of more than 500,000 students today. Tasked with providing education to underserved populations in isolated regions, it delivers diploma, bachelor’s, and master’s programs through distance and hybrid learning systems, using media like radio and TV broadcasts, videotapes, and, increasingly, the internet. While the adoption of distance learning in Indonesia is still modest, growing numbers of other HEIs have followed the example of the Open University and now offer distance learning programs—a development explicitly encouraged by the government in Jakarta. Overall, the e-learning market in Indonesia has grown by 25 percent between 2010 and 2015. It still has tremendous potential for further expansion, given that the country is already viewed as one of the world’s largest markets for mobile learning. Educational quality is a pressing concern in Indonesian higher education. Existing shortcomings are amplified by the rapid growth of the system and the mushrooming of low-quality private providers absorbing the surging demand. In 2017, merely 65 institutions (less than 2 percent of all HEIs) obtained the highest level of accreditation in Indonesia, while quality at the remaining institutions varied—some HEIs had no accredited programs at all. Given the growing quality problems in the private sector, the MHRT in November 2018 announced that it would revoke the permits of some 1,000 private HEIs and gradually close and merge these institutions. Common quality problems include inadequate management structures, funding, facilities, and teaching materials, as well as lackluster research output. Poorly trained university instructors are another issue of concern. More than a third of Indonesian lecturers hold only a bachelor’s degree or less. To improve quality standards, the Indonesian government in the mid-1990s created a National Board for Higher Education Accreditation (Badan Akreditasi Nasioanal Perguruan Tinggi, or BAN-PT), an independent body under the MOE. Alongside the requirement that all HEIs have mandatory internal quality assurance centers, external program accreditation by BAN-PT remains the main tool of quality assurance until today, even though the accreditation process has undergone various changes. At first, only private HEIs were required to have their programs accredited. This process allowed top-rated private institutions to obtain “equal status” (disamakan) with public HEIs, while students in lesser-ranked programs were required to sit for an external state examination in order to graduate. However, these distinctions between private and public HEIs have since been abolished. It’s now mandatory for all HEIs to have their programs accredited. Accreditation is granted for five-year periods and is based on the evaluation of institutional self-assessments and on-site inspections by BAN-PT. Minimum quality criteria include adequate infrastructure, funding and management structures, research output, high-level faculty qualifications, and graduation rates. Based on the evaluation by BAN-PT, programs are grouped into four categories: A (very good), B (good), C (satisfactory), or D (unsatisfactory). Programs rated “D” are unaccredited (tidak terakreditasi). BAN-PT maintains an Indonesian-language database of accredited programs. In 2015, the government also introduced a ranking system that classifies universities into four categories: platinum, gold, silver, and brown (the lowest category). A university’s rank is based on factors like publication output, accreditation rating, and, since 2018, scientific innovation. This new ranking system does not affect recognition status, but is designed to foster competition between institutions. The government seeks to nurture “world-class universities,” and to incentivize HEIs to increase research output by rewarding top-rated institutions with special funding. While accreditation is mandatory for all academic programs offered in Indonesia, the rapid growth of the education systems makes it difficult for BAN-PT assessors to keep up. There were about 3,000 academic programs slated for evaluation in 2009 alone. In 2013, BAN-PT had an estimated backlog of 20 percent in accreditation decisions, causing the organization to adopt “emergency measures” to “give institutions temporary accreditation at “C” level (the pass level) without any accreditation process.” Among accredited programs, public institutions tend to achieve far better results: While 40.6 of accredited programs at public HEIs received a rating of “A” in 2013, only 6.4 percent of programs at private institutions did. Public education budgets in Indonesia have long been neglected. Education spending during the Suharto years was extremely meager, hovering around 1 percent of GDP or less throughout much of the 1990s. Public expenditures have since grown drastically, nearly tripling since the early 2000s. They now stand at 20 percent of the overall government budget, as mandated by Indonesian law. However, overall education spending in Indonesia is still fairly low by regional standards. The country spent 3.6 percent of its GDP on education in 2015, only marginally more than in 2008 when it spent 3.5 percent. That’s a higher percentage than in poorer ASEAN countries like Cambodia and Myanmar, but significantly below levels in Thailand, Malaysia, or Vietnam, which spent 4.1 percent (2013), 4.8 percent (2016), and 5.65 percent (2013), respectively, of their GDPs on education. Spending on tertiary education and research is particularly low with the MHRT receiving only 9 percent of all education allocations in 2018. Since most students are enrolled in fee-charging private institutions, Indonesian households are bearing the brunt of tertiary education expenditures. Even public HEIs rely increasingly on tuition fees to secure resources—a trend that recently caused the Indonesian parliament to amend the education law in order to limit the percentage of tuition fees in public university budgets to 30 percent. Such measures notwithstanding, the existing funding structures and high financial burdens on private households tend to perpetuate social inequalities in Indonesia. In 2010, only 2.5 percent of the poorest quintile of the Indonesian population was enrolled in bachelor’s programs compared with 65 percent from the wealthiest quintile. Admissions criteria at Indonesian HEIs vary by institution, but the minimum entry requirement is the senior secondary school certificate (Ijazah SMA, MA or SMK). Public institutions are generally highly selective. While institutions admit a number of top students directly based on their high school records (an admissions process called Seleksi Nasional Masuk Perguruan Tinggi Negeri—SNMPTN), a more common pathway is the allocation of students to HEIs based on a centralized, joint entrance examination conducted under the purview of the MHRT—a process referred to as Seleksi Bersama Masuk Perguruan Tinggi Negeri (SBMPTN). The admissions test includes general subjects (mathematics, Indonesian, English), as well as subjects related to the intended area of concentration (for example, science subjects for STEM fields). The MHRT recently announced that the test will be given entirely in computer format beginning in 2019. In 2018, about 30 percent of seats at 85 state universities were assigned directly to 110,946 students via national SNMPTN selection, while the remaining 70 percent had to sit for entrance examinations. Admission is usually highly competitive. Out of 797,738 high school graduates who sat for the SBMPTN exams in 2017, only 148,066 students, or slightly more than 14 percent were admitted. The admissions rate in SNMPTN direct admissions stood at 19 percent in 2018. Private universities, polytechnics, and academies have different requirements and frequently conduct their own admissions examinations. Requirements at most private institutions are typically less strenuous than at public HEIs. Indonesia’s higher education degree structure is defined in a logical numerical hierarchy. It includes credentials called Sarjana at the undergraduate level (Sarjana Strata 1 – S1), graduate level (Sarjana Strata Dua – S2, commonly called Magister), and doctoral level (Sarjana Strata 3 – S3, commonly called Doktor). In addition, there are graduate-level specialization programs (Specialis 1 and Specialis 2) in professional disciplines like medicine, as well as four levels of vocationally oriented diploma programs (DI to DIV). S1 undergraduate programs in standard academic disciplines usually last four years (eight semesters) after upper-secondary school. They typically require the completion of 144 to 150 credit units of course work and a thesis. Curricula are mostly specialized apart from some mandatory general education subjects, such as religion, national history, and Pancasila (Indonesian state philosophy). Credentials awarded include Sarjana Sains (degree in science), Sarjana Ilmu Sosial (degree in social sciences), or Sarjana Ilma Komputer (degree in computer science), and so on. S2 Magister programs are relatively new in Indonesia and were not established on a larger scale until the beginning of the 1990s, initially only at public institutions. They are typically two years (four semesters) in length and involve 36 to 50 credit units, as well as the preparation of a thesis or completion of a graduation project. Admission usually requires an S1 degree in a related discipline with a minimum GPA of 2.5 (on a 4-point scale), but entrance examinations and demonstrated English language abilities may also be required. Some S2 programs are taught in English. Credentials awarded include the Magister Sains, (Master of Science), Magister Teknik (Master of Technology), or Magister Humaniora (Master of Humanities), and so on. The Doktor is a research qualification that represents the highest academic credential in the Indonesian system. Programs are a minimum of three years, but usually take longer to complete. Curricula typically include some course work at the onset of the program, a comprehensive examination, and the preparation and defense of a dissertation. Entry is based on an S2 degree with high grades, but top students may also be allowed to enter on the basis of an S1 undergraduate degree, in which case they may have to complete additional course work. Diploma programs are offered in vocational fields at a variety of institutions. These employment-geared programs can take from one year (D1) to four years of study (D4) to complete; the numbers 1 to 4 correspond to both the level of complexity and the nominal length of study (although programs may also be completed in more or less time). The D4 is pegged at the same level as the S1 Sarjana in the Indonesian qualifications framework. Credentials awarded at this level may sometimes also be called Sarjana Sains Terapan (degree in applied science). Students may transfer from Diploma programs into academic Sarjana programs and at some institutions may be admitted into S2 Magister programs in related disciplines. Professional entry-to-practice qualifications in disciplines like architecture, medicine, dentistry, or veterinary medicine are usually earned by completing long undergraduate programs of five- or six-years duration. Given the rapid modernization of the country, the need for trained professionals in Indonesia has grown tremendously in recent years. The number of medical schools, for instance, surged from 27 in 1990 to 83 in 2016. Medical schools are university faculties, close to two-thirds of which are part of private universities. They presently graduate some 8,000 students annually. The national medical curriculum includes an initial 3.5-year period of pre-clinical studies, followed by a two-year clinical phase and a mandatory one-year clinical internship after graduation. The final credential is called Dokter (Doctor of Medicine). There’s also a degree called Sarjana Kedoktoren earned after four or five years, but this credential does not qualify physicians to practice as such without additional study. Institutions like the University of Indonesia offer medical training programs in which students earn a Sarjana after eight semesters and the Dokter after another four semesters of clinical studies. Training in medical specialties takes another three to five years, depending on the specialty, and concludes with the award of a Spesialis diploma. In addition, there are Spesialis 2 programs for additional in-depth training in subspecialties. Study and training programs in disciplines like dentistry and veterinary medicine are organized similarly. Until the mid-2000s, Indonesia’s teachers were able to practice with merely a diploma in education. Elementary school teachers required either a Diploma 2 or Diploma 3 kependidikan (education), whereas lower-secondary and upper-secondary school teachers needed at least a Diploma 3. In practice, many elementary teachers held only a secondary school credential. Just 200,000 out of 1.25 million Indonesian elementary school teachers held a university degree in 2006, while the majority of them had a senior secondary school diploma or a Diploma 2. However, legislation from 2005 made it mandatory for teachers to have a four-year university degree (Sarjana Pendidikan) or a Diploma 4 in education order to qualify for public professional teacher allowances. As a result, the number of school teachers at all levels of school education holding a Sarjana shot up from 37 percent in 2003 to 90 percent in 2016. In order to become civil servant teachers at public schools, candidates must now also fulfill more stringent certification requirements, including a set amount of teaching experience and passing scores on qualifying examinations. Existing teachers were required to seek re-certification under the new requirements. The success rate in upgrading teachers’ qualifications was greater in the school system than in higher education. Current legislation mandates that all Indonesian university instructors hold a master’s degree. However, about 30 percent of lecturers, particularly at private institutions, still don’t meet this requirement. Less than 12 percent of professors hold a PhD, most who do teach at top public universities. Indonesian HEIs use a number of different grading scales, most of which are variations of the U.S.-style A to B scale, either with or without “+” and “-” designations. Some HEIs may use half-point scales with grades like AB, BC, or CD. A common grading scale variation is shown below. Note: Precise, word-for-word English translations are required for all academic documents not issued in English (or in French if applying in Canada). Calculation based on the sum of Population aged 14 years or younger and Population aged 15-24 years from 2017 UIS data. The number of degree-seeking students reported by UIS increased from 5,704 in 2007 to 8,038 in 2016, before leveling off to 5,823 students in 2017. When comparing international student numbers, it is important to note that numbers provided by different agencies and governments vary because of differences in data capture methodology, definitions of “international student,” and types of mobility captured (credit, degree, etc.). The data of the UNESCO Institute Statistics provide the most reliable point of reference for comparison since it is compiled according to one standard method. It should be pointed out, however, that it only includes students enrolled in tertiary degree programs. It does not include students on shorter study abroad exchanges, or those enrolled at the secondary level or in short-term language training programs, for instance. These are Singapore (27.2 percent), Malaysia (8 percent), Brunei Darussalam (3.8 percent), Thailand (1.3 percent), Laos (0.4 percent), and Vietnam (0.24 percent).